When CCH made the transition to IntelliConnect there was some uproar. The resistance to change focused on the seemingly dramatic shifts in log-in, interface, navigation, and access. Even though this took place back in 2009, it feels like long ago that weaccessed the Tax Research Network. However, the world didn’t end and our practice groups continue to chug along. IntelliConnect aimed at a revolutionary legal research step. Whether that has happened or not, the news for now is their next evolutionary upgrade. This update has been sorely needed and will (hopefully) make IntelliConnect a more intuitive system. Interface clutter aside, my issues with IntelliConnect mainly dealt with sorting through research results. The new features help break results up by document type and include jump links to specific document types. For the last two years the results tray was quite jumbled. Also available is a CCH mobile appthat might be the best thing for new users and hesitant IntelliConnect adopters. Mobile apps force a minimalistic interface, design, and presentation. 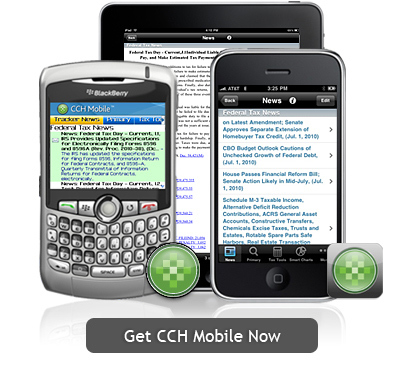 The CCH app has a simplicity of use that makes navigating a cinch. Unfortunately I can’t give a review of the mobile app. I’ve received constant errors when attempting to log-in.